The 5.5 centre console is down the bottom end of the Chivers’ size scale, but in its fit out it is punching up there with the big boys. Everything about this one says it is a serious fishing boat. The evidence starts with nakedness, the only painted item being the motor. But the raw aluminium has its own beauty: knowing there was to be no filling or sanding, Chivers’ welders produced a masterpiece that did not need either. Naturally there is a removable bait tray and a power deck wash. Individual anglers are spoiled by three fishing positions on each side having their own rod sockets and sinker or drink holders. More sockets are at the T-top’s rear. 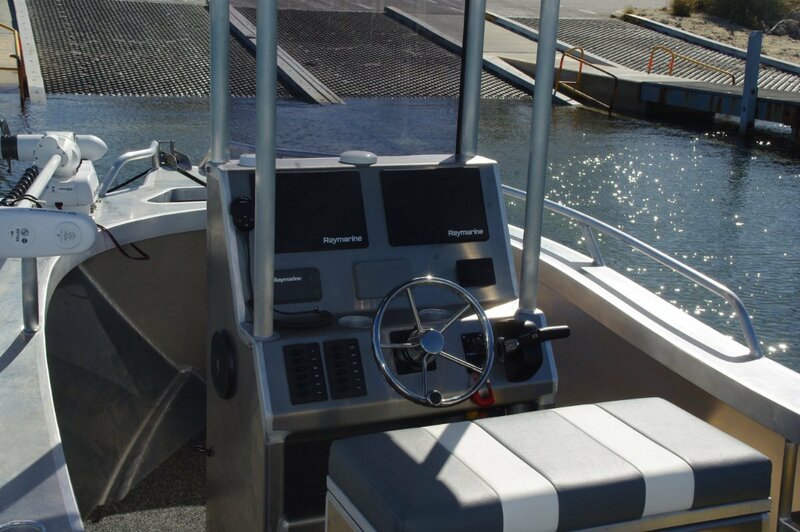 The console features a pair of Raymarine screens, more evidence of purposeful fish hunting. Unusually, it also has the wheel (stainless steel and with knob) mounted dead centre, even though the simple box seat is nominally a double. 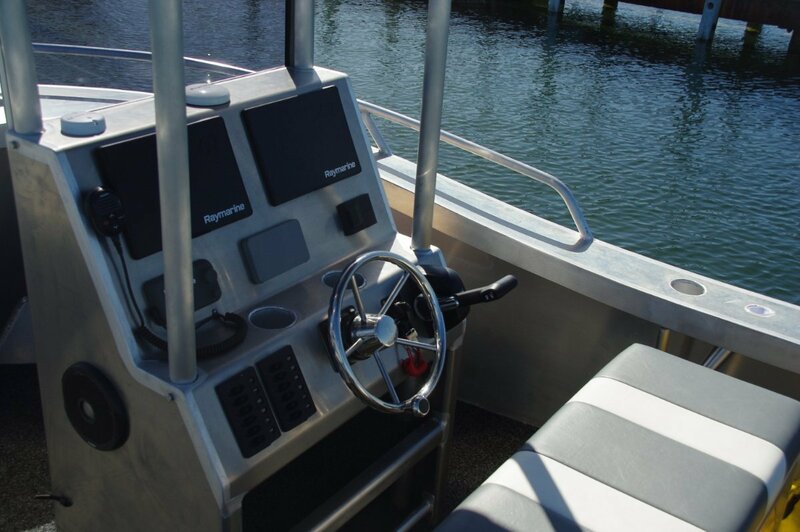 Stowage, probably more than a dedicated fisherman would use is provided by two shelves in the console and a locker under the seat. The full height windscreen would put up a lot of drag under tow, as well as being choosy about what it parks under, so it has been fitted with hinges. Additionally, the T-top’s supports telescope to lower it. As well as the usual aerials the T-top mounts pairs of floodlights fore and aft. On top it has been set up for the future installation of a solar panel. In the early days, auxiliary electric thrusters were just stealth movers for river anglers, but not now. The 5.5’s Minn Kota has the sub title Saltwater and this item has thrust. It also has a brain. Effectively, it is a dynamic positioning device: find your lump and this will hold you over it. 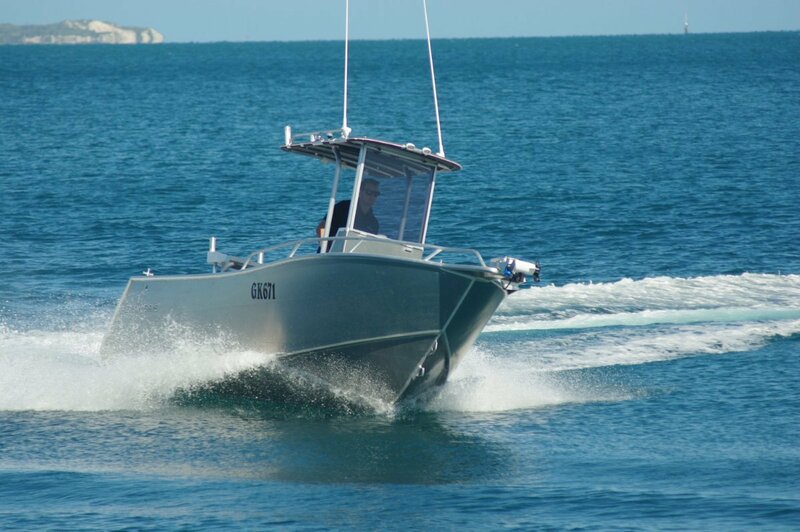 The 5.5 is one of Chivers’ Shark series with longitudinal framing, so has the long twin under deck catch tanks with gas lift lids, and the auto flooding ballast tank between them. The deadrise is not as great as the larger Sharks but is still pretty sharp; the ballast, though, did a fine job of keeping us upright at rest. 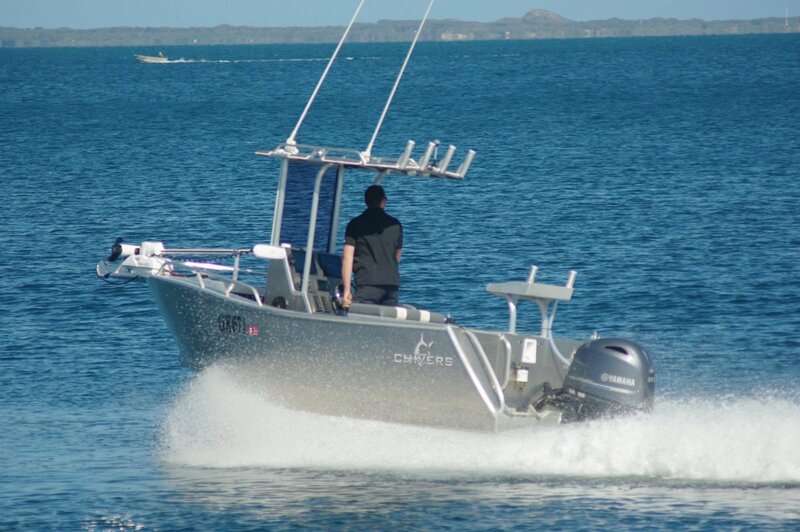 The 115hp Yamaha, which has more than ample power for the job of driving the 5.5, had us deballasted and planing on the way to 35 knots practically the instant the throttle moved. If 115 is not enough the hull can handle another 15hp. The owner made the unusual choice for a boat of this size of a dual axle trailer. Presumably he has long road trips in mind, the second axle making a huge difference to the smoothness of the tow. The trailer extra that is always welcome was the auto catch. 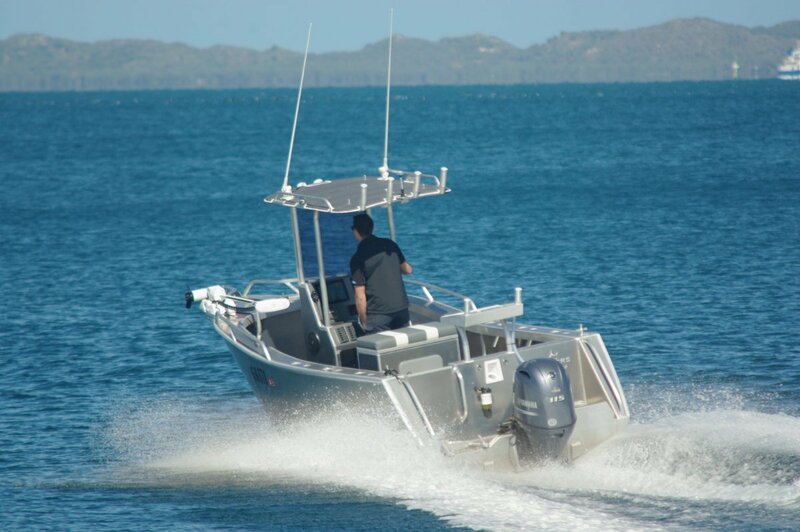 Long trips on the water also seem indicated as the owner specified an enlarged fuel tank capacity of 180 litres. This is a boat that will see a lot of use.